"From error to error, one discovers the entire truth"
Genealogy is a lot like doing a huge jigsaw puzzle. Pieces are tried and re-tried until they fit and once completed there is little doubt it is right. But genealogy differs in that it is unknown if all the pieces are on the table; some are under the table, and some do not yet exist. Given what we have at hand, we find that some pieces seem to fit, but because new pieces can arise from anywhere, and because the puzzle never ends, we must always be prepared to accept a new and more researched view. So it has been with Theophilus WATTS. He was born in England and is the oldest known ancestor in the WATTS line. He married Dorothy Ann, in Halifax, Nova Scotia, and they had three children born in Halifax between 1824 and 1828. Theophilus William, Jane Adelaide, and John Henry. The dilemma has been the maiden name of Ann Dorothy. The first piece of the puzzle comes from the book Genealogy of the Counter Family, compiled by William Charles COUNTER, grandson of Charles COUNTER. On page 13, in reference to Jane Adelaide, it states, “Her father, Theophilus WATTS, of English parentage, was born in England. Her mother, Ann Dorothy GROSGNELL, whose parents came from Wales, was born in Nova Scotia.” This document, in its entirety, can be accessed and downloaded here. The second piece of the puzzle comes from the 1910 death record of Rev. John Henry WATTS, son of Theophilus and Ann. As the informant, his wife Elizabeth reported that her husband was the son of Theophilus WATTS and Ann Dorothy CROSBY. Although an original document, it is one generation removed and relies on the memory of an elderly informant. Without further research we would be left rationalizing how GROSGNELL could evolve into CROSBY, or vice versa. But now, a third and newer piece comes from the work of a researcher, Connie Sweetman, who has sought out the original records of Theophilus and Ann. The first of these is their marriage bond. When a couple planned to marry, the prospective groom took out a bond to ensure there was no legal obstacle to the proposed marriage. 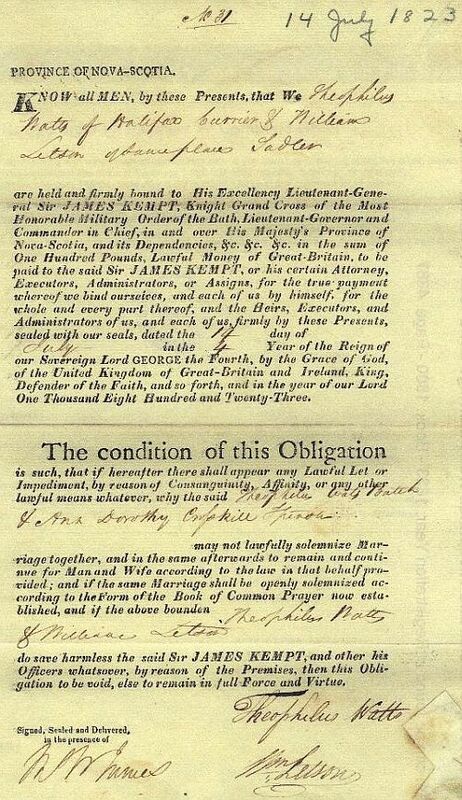 The marriage bond between Theophilus and Ann Dorothy is dated, “The fourteenth day of July in the 4th year of the Reign of our Sovereign Lord George the Fourth….. and in the year of our Lord, one thousand eight hundred and twenty three”; the names appearing on this document are Theophilus WATTS, Bachelor, and Ann Dorothy CROSSKILL, Spinster. While the actual marriage document has not yet been seen, an index of marriages compiled from primary sources identifies their marriage as having occurred two days later, on 16 July 1923, at St. Paul’s Anglican Church in Halifax, Nova Scotia. The sources above are certainly sufficient to prove Ann Dorothy's maiden name. Nevertheless, perseverance often brings reward. Further research by Connie Sweetman now provides us with previously unknown facts. Little more was known of Theophilus and Ann. It is now apparent that Theophilus WATTS died a young man. His burial record from St. James Methodist Church in Montreal states: Theophilus WATTS of Montreal, Currier, died on the fourth day of January one thousand eight hundred and thirty two and was buried this twenty sixth day of the same month and year in the presence of the inheriting witness. Other names appearing on this document are Ann Dorothy WATTS and F. WATTS. On 1 November 1833 Ann Dorothy WATTS married Nicholas WALTON at St. Paul’s Presbyterian Church, in Montreal, Quebec. 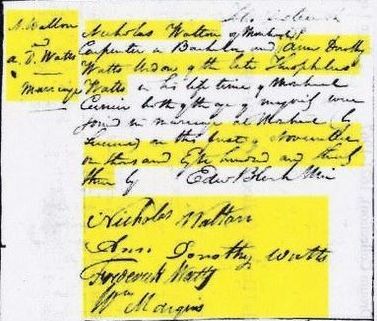 The marriage document reads: Nicholas WALTON of Montreal, Carpenter, Bachelor, and Ann Dorothy WATTS, widow of the late Theophilus WATTS, in his lifetime, Montreal Currier, both of the age of marriage, were joined in marriage at Montreal, by license, on this first of November one thousand eleven hundred and thirty three by Edward Black, Min. Witnesses were Frederick WATTS and Wm. MARGINS. Nicholas and Ann Dorothy WALTON subsequently had a family of four. Nicholas WALTON, Jr., born Montreal, Quebec (1834-1912); Sophia Margaret WALTON born Montreal, Quebec (1836-1919); Frederick Thomas WALTON born Hamilton, Ontario (1837-1899); and Eliza Ann WALTON born Hamilton, Ontario (1839-1844). On May 4, 1854, their daughter Sophia Margaret WALTON married George INGRAM. Their family was large but the naming of three children in particular are of significance. Their first born daughter was named Ann Dorothy Catherine INGRAM in honour of her grandmother; and, her two older brothers were John Henry Watts INGRAM and George Crosskill INGRAM. Perseverance rewarded ! In conclusion, we can safely say that this new research has allowed us to confirm the true maiden name of Ann Dorothy. The pieces fit; but as is usual when doing family history, one solution often leads to another question. So we must ask, who was F. WATTS who attended the burial of Theophilius, and Frederick WATTS who attended the second marriage of Ann Dorothy? Presumably they were the same person. Connie Sweetman reports, “There was a Frederick WATTS who lived and died in Quebec at the time when Theophilus and Ann were there; his spouse was Sophia. I have not been able to connect him to Theophilus yet, but he may have been his brother. Notice that Ann had a son named Frederick and a daughter, Sophia. Curious.” ……and the puzzle is on the table again. Update: Since this was written last month, Connie Sweetman has informed me she has discovered that Theophilus and Ann Dorothy WATTS had a fourth child born to them. Frederick Samuel WATTS was born in Montreal, Quebec on the 22cd of June 1830; he was baptised on the 5th October 1830 at St. James Methodist Church in Montreal.